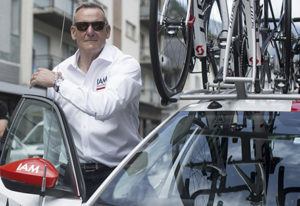 Passionate about cycling, convinced of the visibility and the great development potential of Swiss cycling, Michel Thétaz, CEO of IAM and founder of IAMFUNDS.CH decided 2012 to invest in order to create the only Swiss pro-continental cycling team. The team already joined the World Tour in 2014. The team is the perfect ambassador for IAM , which is now known not only in Switzerland, but around the world as well. No doubt that the philosophy, which is the foundation of the company IAM’s success since over 20 years and its investment style based on judgement, discipline, patience and vision, allowed the IAMCycling Team to follow in the tracks of IAM and to deliver outstanding performances. An extraordinary human and sporting adventure and a unique opportunity to spread IAM's brand values at the highest level: discipline, patience and vision. The end of the 2016 season has arrived, and the record for the IAM Cycling team is quite extraordinary. They succeeded in capturing stage wins at the Tour de France, the Giro d’Italia, the Tour de Suisse, and two stages at the Vuelta a España! Nevertheless, the team did not succeed in finding a co-sponsor. Consequently it will not be continuing in the professional peloton into 2017, which would have been its fifth year. In fact, IAM will work along with the IAM Cycling structure to support various cycling events that will include the IAM Champex Challenge and the IAM Junior Challenge. These events have already taken root, and will complement the partnership with “Give it all – Cycling for Children”, which is an initiative established by UNICEF at Crans-Montana, in the heart of the Swiss Alps.